light, create the feeling of space and retain excellent thermal efficiency and usability. "Provide your customers with the ultimate alfresco dining experience this summer- install high quality bifold doors which let the outside in and flood your restaurant with natural light"
Many diners welcome the chance to enjoy the freedom and 'open-air' advantages of dining alfresco and many enjoy this over eating indoors, however we all know that the Great British weather can be somewhat unpredictable. 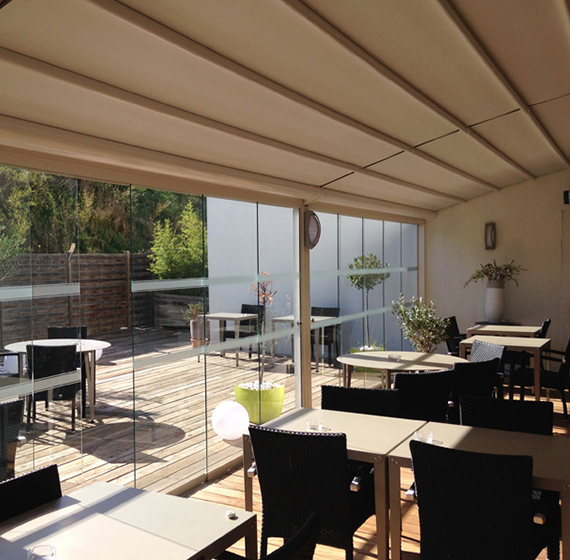 Installing bifold doors can provide the ideal opportunity to enjoy the many benefits of alfresco dining, whilst protecting guests from the elements during wet, stormy weather. With a selection of beautiful full length bifold doors, you'll have the option to create a stylish, open plan space, flooding your restaurant with natural light from floor to ceiling. Installing bifold doors provides you with the perfect opportunity to embrace the great outdoors, combining your indoor and outdoor spaces to create an alfresco dining area for your guests to enjoy on sunning days and bright summer evenings. Our range of bifold doors can be manufactured in a wide range of RAL colours, designed specifically to suit the existing features of your property.